Money, money, money! Click here to play! 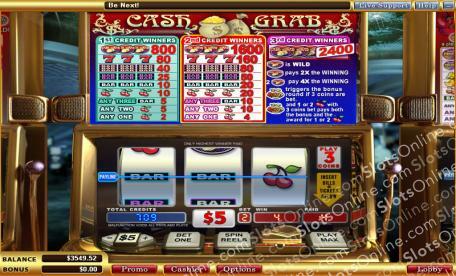 That's the name of the game on this slot machine � well, not exactly, but Cash Grab is close enough! Moneybags and Wild symbols are your best friends in this 3-reel, 1 pay-line game. You are given the chance to wager 1, 2, or 3 coins on each spin, but you can only get the chance to enter the Bonus Round when you bet 3 coins. If you manage to get a Bonus symbol on a 3-coin spin you will enter the Bonus game. Once there, you will be offered a number of moneybags to choose from. If you select a bag and decide that the amount is not sufficient you may select another bag. When you are happy with your Bonus amount you will be returned to the reels and the prize will be added to your gaming balance. There are plenty of other ways in which to win big in Cash Grab ranging from your standard cherry to single, double, and triple bars. Remember, the more coins to play each spin, the more your return will be when you win. Why not have a go at Cash Grab? Its sheer simplicity and guaranteed win Bonus Round should be enough to entice any slots fan! The Cash Grab symbol is Wild in the Cash Grab slot machine. It allows combinations to be completed and increases payouts 2 times when 1 symbol appears, and 4 times when 2 appear. The Bonus Round is triggered when a Bonus Round symbol appears on the center pay-line. You must have played 3 coins on the spin to earn a Bonus game. Cash Grab's Bonus Round is a guaranteed win game, and players can select moneybags to reveal cash prizes. If they like the amount they select they can take it and leave; if not, they may select again until they have found a sound prize amount.